Anyways here are two of my recent pages using my latest toolkit packs which are now in my store over at Scrap Stacks they are called 'A Tad Torn V.2' and 'Make It Stay Fasteners Pack'. These two are nifty little packs to have in your digi stash because they are perfect to use in all your projects. 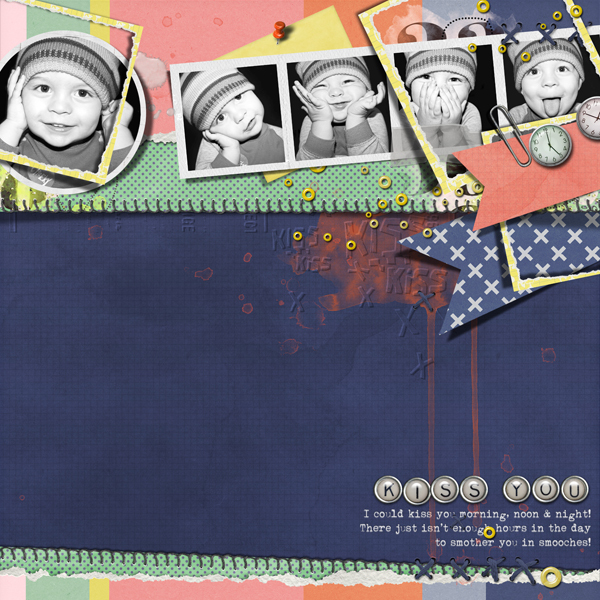 The torn edged paper templates will create some realistic effects and the fasteners.... well everyone needs a handy collection in their stash as a 'go to' pack for all your anchoring needs, don't you agree? Thanks for stoppin' by have a fabbo weekend! Cool designs - great work!! Gorgeous work as always. Love how you have used the torn papers as frames. Think I'm going to hijack that idea! Also loved the raised embossing of the stamp 'kiss, kiss'. Always inspiring. Thank you! Really lovely, Em.....especially your boy with that series of photos....the little round alphas at the bottom are YUM! You brilliant designer, you!!! !